HipHopopotamus Fruit Machine Guide & Review - Casino Answers! 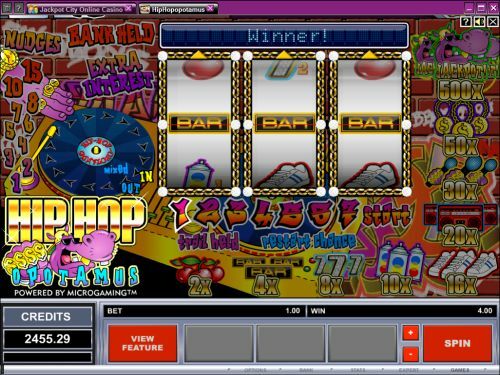 HipHopopotamus is a 3-reel, 1-line fruit machine developed by Microgaming, featuring nudge features, hold features, a bonus game and more special features. You can play the HipHopopotamus AWP fruit machine at Bovada. Bets on the HipHopopotamus slot machine are $0.10, $0.20, $0.25, $0.50, $1, $2, $5 and $10. There are no coins or paylines to select or worry about on HipHopopotamus. To play the HipHopopotamus fruit machine, all you have to do is select one of the bets listed using the “+” and “-” buttons and hit the “Spin” button. The highest paying symbol on the HipHopopotamus fruit machine is of course the HipHopopotamus symbol. If you hit 3 of these symbols on the payline, you will win 500X your bet. You can win this jackpot by playing HipHopopotamus at your choice of Microgaming online casinos such as Bovada. There are 9 winning combinations on the HipHopopotamus fruit machine. The complete payout schedule is as follows (payouts in parenthesis): 3 Cherry symbols (2), 3 Bar symbols (4), 3 7’s symbols (8), 3 Spray Can symbols (10), 3 Trainer symbols (16), 3 Ghetto Blaster symbols (20), 3 Mic symbols (30), 3 Bling symbols (50) and 3 HipHopopotamus symbols (500). The Trail Ladder is located below the game reels on the HipHopopotamus slot game. If a symbol is labeled with a number, you will advance positions on the Trail Ladder. You will only retain the position on the next spin if “Trail Held” lights up (randomly). If you hit a symbol with a “Bonus” label on it, you will have the chance to activate 1 of 4 reel bonus games. The four bonus games will flash in the information window and you will have to hit the “Stop” button to win one of the special features. Boost will randomly boost the position on the Trail Ladder. On Skillshot, the Trail Ladder positions will flash in sequence, so you will have time when you hit the “Stop” button to activate the Hi/Lo bonus game. Stoppa is similar to Skillshot, but the numbers will flash randomly. In Selector, groups of the Trail Ladder numbers will flash randomly. Hit “Stop” at the right time to trigger the Hi/Lo bonus game. HipHopopotamus also has the Scratches feature. Scratch arrows are randomly added to the turntable during the regular slot game. Once the turntable is filled with arrows and returns to the starting position, the Hi/Lo bonus game is activated. Any regular win on the reels also activates the Scratches feature. The Scratches turntable spins automatically and stops at a random position. If the hippo is mixed out, you collect your regular win and the game ends. If the hippo is mixed in, your regular win is awarded again. The Scratches feature is repeated until the hippo is mixed out. Another random special feature on the HipHopopotamus fruit machine is the Shifta! feature. One reel will be held while the other reels will spin into an automatic winning combination. Similar to the Shifta! feature, the Funk You Up feature is randomly awarded after a losing spin on HipHopopotamus. The various regular symbol names flash randomly in the information window until you hit the “Stop” button. The reels automatically spin in the symbol combination you stopped. 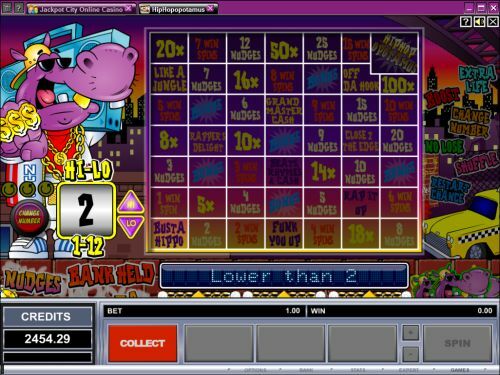 Nudges are randomly triggered features on the HipHopopotamus slot machine. You can win up to 15 nudges at a time. Use the arrows at the top of the reels to choose which reel you wish to bump. There is also the Nudge Bank Held feature where you can save your nudges for your next spin and Extra Interest Nudges where you can win more nudges when your nudges are banked. As you can expect from a fruit machine, HipHopopotamus has a hold feature, which is another random special feature. The “Hold” buttons appear below the reels. You can hold one or more reels in the same position for the next spin. If you change your mind and don’t want to hold a held reel, hit the “Cancel” button. HipHopopotamus gives the fruit machine player all they expect from a great fruit machine. HipHopopotamus offers a comical theme, a giant bundle of special features and some decent payouts (for a fruit machine, at least). HipHopopotamus is a lot of fun and definitely a recommended fruit machine that you should play at Bovada! Can I play a free Flash game of the HipHopopotamus fruit machine for real money? Yes, you can play the HipHopopotamus online slot at the Instant Play casinos at Bovada. You can play for free or you can also play for real money. If you experience any difficulties with the Instant Play casino software, make sure you download the latest version of Adobe Flash Player. Where can I read more fruit machine reviews? For more fruit machine reviews from Microgaming and other online casino platforms, please read our list of fruit machines.